Disclosure: This is a sponsored conversation written by me on behalf of Schlage. The opinions and text are all mine. While curb appeal gets a lot of attention when you are selling a house, it can sometimes be neglected when you are actually living there. It's easy to get overlooked since you spend most of your time INSIDE and other jobs can take priority. But, there are easy ways to improve a home's curb appeal without a ton of effort (so you can get back to your big to-do list elsewhere) and reap the rewards you can enjoy every time your return home. There are plenty of traditional, time tested ways to improve your curb appeal from great landscaping to beautiful woodworking to upgraded lighting. You probably have already heard them all so I won't bore you with the basics. Instead, I'm sharing a few easy tricks that you might not have thought of before. Added bonus is that they that take very little time or money to implement but still reap big rewards. Trick #1 | Opt for dark colors Instead of getting a new front door, paint your existing one with a rich shade to create a modern eye catching entry. 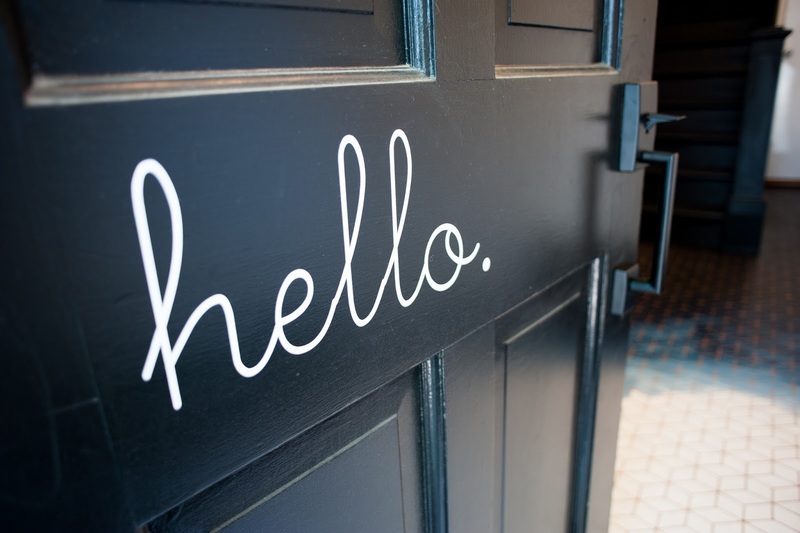 While investing in a fabulous front door is generally a great idea, paint can do wonders at a fraction of the price. Skipping the bright colors and sticking with a dark shade will help hide a multitude of sins while making even an outdated style appear modern and fresh. Black is a perpetual favorite, but you can create the same impact with rich inky blues, forest greens and charcoal greys. 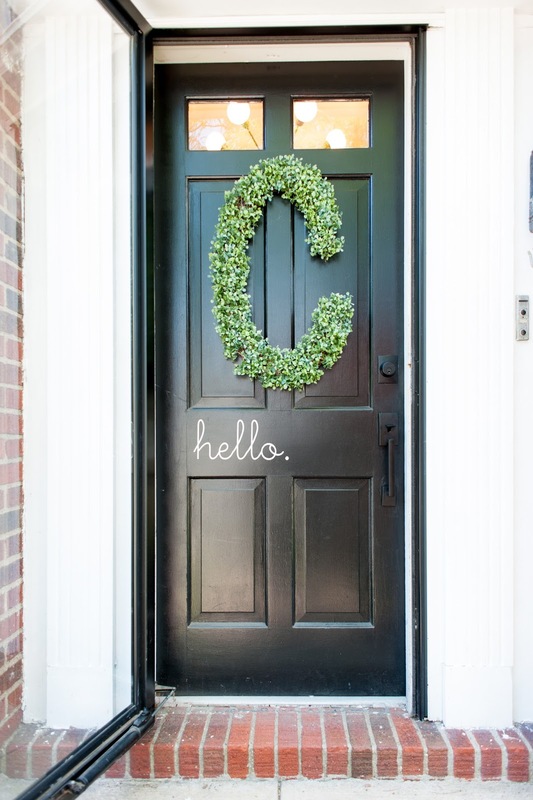 Don't be afraid to go dark here as a deep front door will attract the eye -particularly if your home is painted a lighter shade. The same concept is employed by a winding stone path, spot lighting and great molding but this idea is a much easier solution with the exact same result! Trick #2 | Update your door hardware Even the most outdated door gets an instant pick me up with a new front handle set. 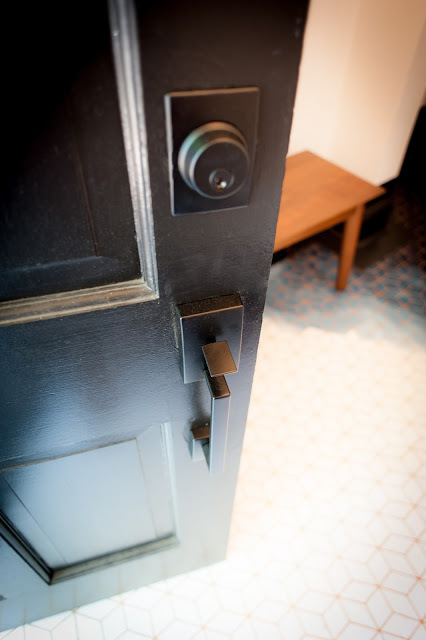 Especially if you pick something with great clean lines like SCHLAGE'S CENTURY FRONT ENTRY HANDLESET. 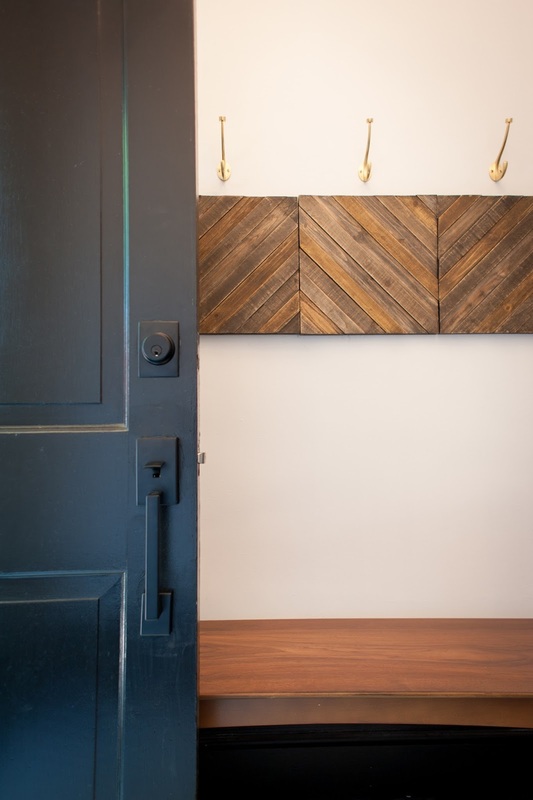 Not only is this an easy upgrade to install that beautifies your entryway - it also improves the security of your space in a flash. You can go two ways with finish. 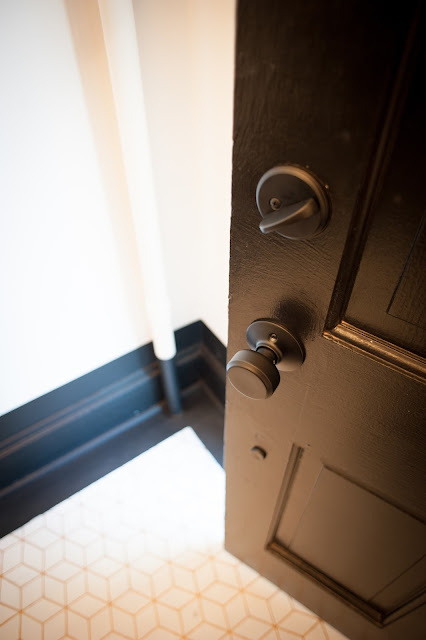 Opt for the matte black finish on a dark door (as in this example) to give a more modern, monochromatic feel to the entry space Or go with a matte brass or nickel to create some visual contrast and eye catching reflective surface. Either way, the new handleset will create the impression of a more updated home in a flash. Thanks Laura! It's my friends door but I just love it. It's so eye catching from the street.